Mourning Someone Else’s Choice: Pro-Life Selfiness | Seriously?!? 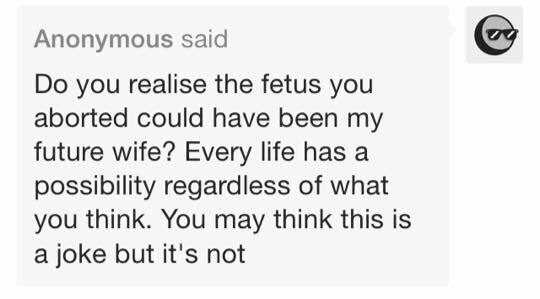 Note that this commenter is talking about possibly marrying a hypothetical female embryo who if born would be, you’d think, *at least* several decades younger than him too. So yeah, possibly but only very remotely possibility indeed. Or, hey, the fetus that was aborted could’ve been your worst enemy instead ..or someone like Trump or just an a-hole who made life worse for everyone around them. We’ll never know – and it doesn’t actually matter because its the flippin’ individual persons’ choice and their life not yours! It’s Not That I Don’t Understand, I Disagree.